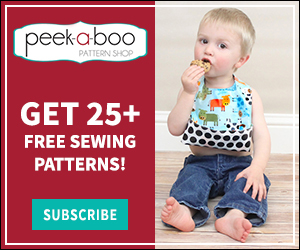 Classic Footed PJs Sew Along Day 1 - Peek-a-Boo Pages - Patterns, Fabric & More! Welcome to the Classic Footed PJs Sew Along! 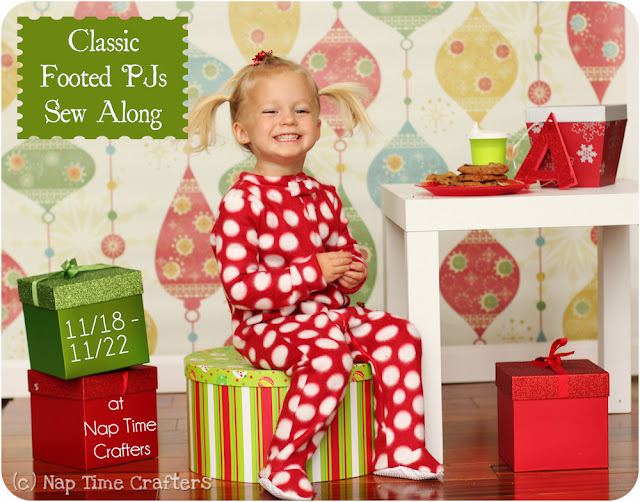 If you haven’t yet make sure you go get your Classic Footed PJs Pattern so you can join in the fun! It has recently been updated to include more sizes and options and an improved fit. If you didn’t get the update yet email a receipt to “peekaboopatternshop(at)gmail(dot)com” and I’ll get you the free update. The Classic Footed PJs are designed for fabrics with a bit of stretch. My favorite choices for the body of the PJs are fleece and interlock. You can use jersey but it tends to be a bit thinner and less stretchy. You can use fleece for the accent fabric (I did) but rib knit or interlock will give a bit better finished results. If you want to use fleece I highly recommend using anti-pill as it will hold up better. I used a no-sew fleece throw kit from Jo-Anns and was just barely able to get a 2t and 4t pair out of the main fabric. I used the contrast for my accent fabric and the feet. You have 2 options for the zipper either a full zipper that goes down the leg or a 1/2 zip that only goes down the chest. For older kids I highly recommend doing the 1/2 zip because it will be much easier to find a zipper in the length and color you want. If you are doing the full zipper in a larger size Zipper Stop is a good online source for long zippers in a wide variety of colors. For the bottom of the feet you will want some non-slip fabric. You can find it pre-packaged on the notions wall or buy it by the yard in the utility fabrics section. Alternatively you can use puff paint on the bottom of the feet. For the baby sizes you can omit this. Print out your pattern at 100% using the chart on page 3 to only print the pages you need for your size. Tape everything together along the dashed lines and then it’s time to cut! Everything should be cut so the stretchiest direction of the fabric is going around the child’s body as indicated by the arrows on your pattern. If you are doing the full zipper option you will cut a left and a right front piece and 1 back cut on the fold (as shown in green). If you are doing a 1/2 zip both the front and the back are cut on the fold (as shown in red). Along the neckline use the dashed lines to cut the front neckline and the solid neckline in back. Use the dotted lines along the hem to cut out the foot cut-out for the front pieces. 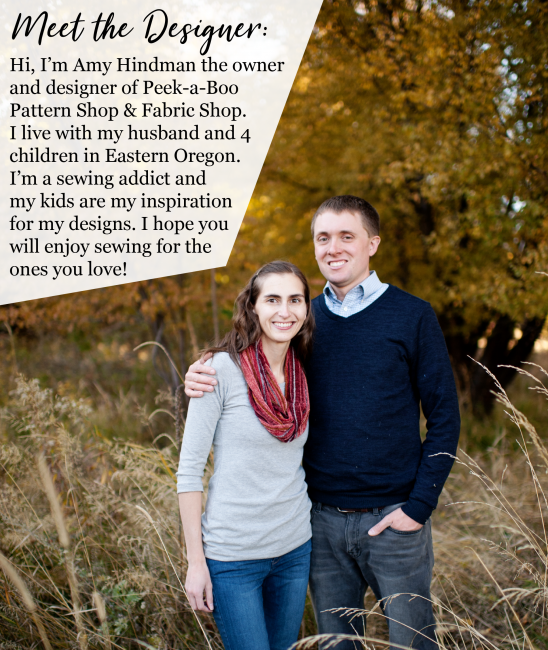 Come back tomorrow and we’ll start sewing! Previous Post: « Designer Challenge: Lily Knit Blazer Release, a Discount & a Giveaway! I am making some footed PJ pants I was wondering what kind of fabric is cozy easy to use and is affordable? how much fabric do I need for footed pajamas? I am an adult teen. I am in a clothing class in school.